Happy Thanksgiving - Punch Up Your Holiday Tolerance! | Studio 3, Inc. Happy Thanksgiving – Punch Up Your Holiday Tolerance! Punch up your holiday tolerance with Studio 3….because the time for family arriving is nigh. For Thanksgiving this year, we wanted to go the less traditional route and showcase some arresting Editorial Photography with a irreverent holiday twist. Thanksgiving usually brings to mind turkey, stuffing, and time with the fam, so Studio 3 created a concept that breaks with the tradition of poultry and instead puts the spotlight on a festive holiday gathering…with a subtle kick! So the concept that evolved was to feature a bowl of punch being spiked at a large, brightly-lit party setting. Rather than focusing on the product as we might for a straightforward product photography shoot, Photographer Craig Wagner brought out the irony of the scene in-camera with the use of a tilt-shift to control the plane of focus. The camera angle was established ahead of time with our Photography Assistant Jonny Brandt. Ms. Liz whipped up a delicious Spiked Spiced Rum Punch from scratch (recipe appears below). We used a Studio 3 favorite, Below Deck Spiced Rum from Eastside Distilling for the “liquid courage” to add to the punch. For the shot the liquor bottle was not actually filled with rum- why waste good spirits in drink photography? Instead, we removed the citrusy rum (to enjoy for later) and replaced with a Studio 3 standby: Kitchen Bouquet, a food styling tool of ours for creating browned foods and beverages in photos. Thus in the final image above, the model is actually pouring Kitchen Bouquet into a concealed catch basin inside the punchbowl so the punch does not change color or increase in volume during the shot – a little trick we’ve been using for decades in our beverage photography. And no, that doesn’t make for a consumable beverage afterwards…but it’s all in how it appears on camera. Since this holiday brings to mind both the happiness and disharmony of putting in an appearance at the yearly family gathering, why not make your own Studio 3 Tolerance Punch (sans Kitchen Bouquet) to get yourself blitzed ahead of time? You’ll be ultra-ready for when those in-laws come ringing your doorbell, guaranteed. Happy Thanksgiving from the Studio 3 Team! 1. Bring the orange zest, cinnamon sticks, cloves, ginger, water, and sugar to a boil in a small heavy saucepan, stirring until the sugar has dissolved. Reduce the heat and then simmer, covered, 5 minutes. Remove from the heat and let steep, uncovered, for 1 hour. 2. Strain through a fine-mesh sieve into a bowl, discarding the solids. 3. 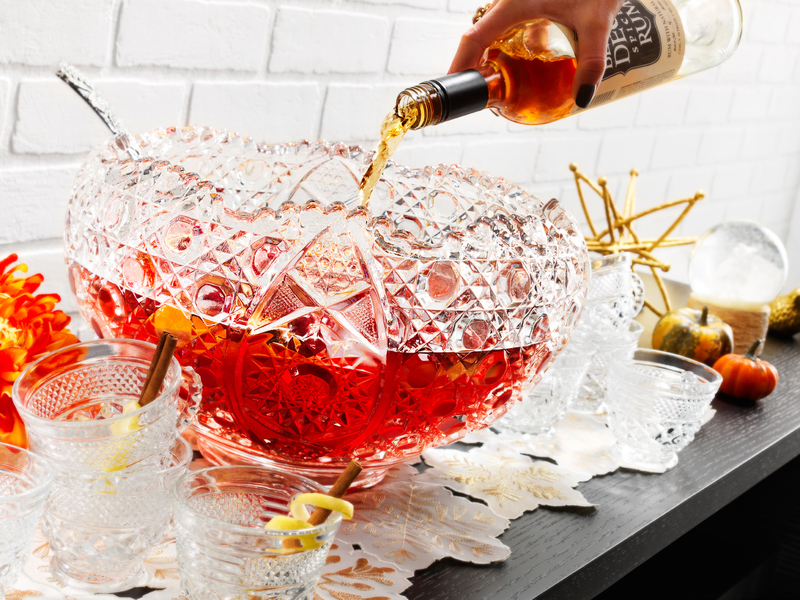 Combine the remaining ingredients with the spiced syrup in a punch bowl and stir. Add ice before serving.